I am the proud owner of my second Bonnie Lambert painting, aptly titled “Proud Cloud.” I saw a picture of this 6″x 6″ gem on the invitation to Bonnie’s Show at Coffee Fix in Studio City and *had* to have it. It was as if Bonnie was looking out my studio window! 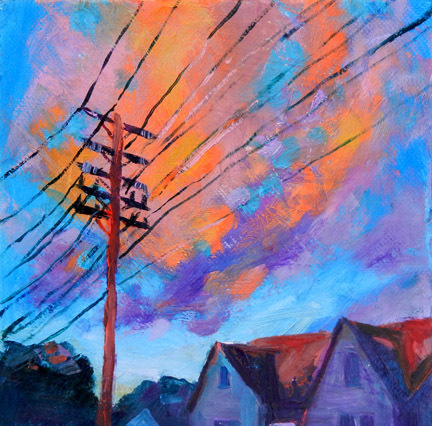 That is Bonnie’s special talent: capturing and moments of beauty in every day landscapes–a lone telephone pole is regal against a splendid cloudscape–the one without the other would be prosaic, but together they celebrate the world at hand. Awe is tempered by a satisfying sense of recognition–my yard, my street, my sunset–only better. 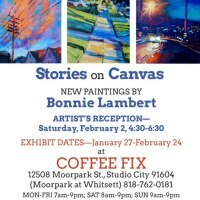 I plan on visiting my painting at the Coffee Fix later this week. Feel free to stop by for a cup of joe and take in the art .